Lorna joined us as a nursing assistant in 2004 before going on to train as a Veterinary Nurse within the practice, qualifying in 2009. This means she can carry out a range of nursing tasks and minor procedures, as well as offering advice to pet owners. She has interests in radiography, inherited diseases and small animal reproduction. 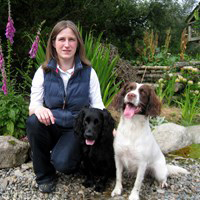 She enjoys training and working her spaniels.